Storm clouds over the City of Winnipeg in Manitoba, Canada block out some of the bright yellow hues which blanket the sky during this particular sunset. Threatening storm clouds hang over the City of Winnipeg, Manitoba at sunset blocking out some of the yellow glow spanning the sky. The trees are highlighted from the brightness of the sky while fields appear dry hoping for a short burst of rainfall. A sunset like this is fairly common over the City of Winnipeg, Manitoba creating a paradise for photographers. Storm clouds move in fairly quickly as the prairie landscape offers no mountains or hillsides and weather systems change rapidly. Winnipeg City is home to about 675,000 people making it the largest city throughout Manitoba, Canada and it makes it hard for some to take time out to enjoy a yellow sunset such as this. Many take cover due to the threat of a storm while others sit back with their camera and watch the sunset sky explode in various hues. 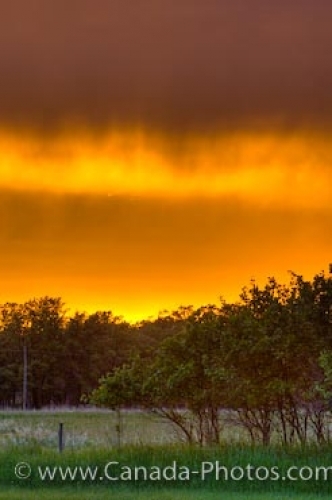 Picture of the yellow sky at sunset with storm clouds moving in over the City of Winnipeg, Manitoba. Sunset over the City of Winnipeg, Manitoba, Canada.